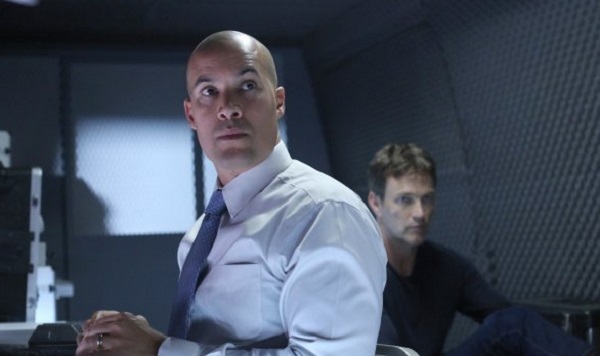 Last week on The Gifted, the Strucker family started to get used to the new normal. They are on the run from the mutant-hunting Sentinel Services while patriarch Reed is in their custody. Those in the Mutant Underground had their own problems, Blink’s teleporting powers started to go haywire, requiring Strucker family matriarch Caitlin to head with Marcos to the nearest mutant healthcare clinic to get her some medication to help stabilize her. While they were able to prevent her powers from completely destroying the Mutant Underground facility, Reed was forced to cut a deal with the Sentinel Services to give up the Mutant Underground in exchange for his family’s safety. And they just made new friends. This week started with a flashback showing simpler times between Marcos and Lorna when they were first setting up their satellite location that everyone calls home. You can see the reason that he’s so gung-ho for her now as the two have some serious chemistry. She reveals to him the first good thing she did when she got her powers, fly by using her magnetic powers on her metal boots and jewelry. Although Marcos claimed he had no good times when he first got his powers, he shows her what he’s capable by using broken glass as a way to use his light powers to create a beautiful mirage. To further hone in that the two are made for each other when they touch their powers interact with each other by fusing her magnetism with his solar abilities. He’s most definitely going to get her out of jail! Fast forward to the present, a worried Marcos wants to find a way to get her out of jail. Of course, being in a maximum-security prison doesn’t help his odds. He thinks that the Mutant Underground has a ringer this time though, Blink. With her teleporting powers, she should be able to get them into any place she concentrated on. The problem is, she’s a neophyte when it comes to using her abilities. Like most mutants, her powers were activated out of fear, and fear’s all she knows. Marcos taps John Proudstar to help Blink find a way to control her powers. But it’s not so easy as he continues to try and train her. As he speaks with another Mutant Underground member Dreamer (guess what her powers are) who thinks that if Blink is going to gain control of her powers, she will need a more positive motivation. John forbids her from moving forward with that option. Caitlin is desperate to find her husband Reed. Although she’s now a fugitive, she’s still thinking like a civilian and wants to try and lawyer up to see what rights they have. Marcos and John no that’s a nonstarter, but she manages to sneak off in the middle of the night to try and get in contact with her brother who could help her. Because she’s powerless, her two children Lauren and Andy go with her as they don’t want to lose he and their father. Speaking of their father, Reed is at the mercy of the Sentinel Services. Already agreeing to help them find and arrest the Mutant Underground, he has to go to the bar he first met Marcos at. As he runs into the bartender, he asks to be taken to the Mutant Underground headquarters. Sentinel Services already put out a cover story that he escaped their custody, so he’s none the wiser. The bartender agrees to help Reed and inside the bar, Reed is joined with a mutant mother and her daughter who also want to go on the run. This is where Reed’s conscience starts to kick in. He finds out that the Sentinel Services already abducted the woman’s husband and would capture her and her daughter if they get the chance. As they are about to be ferried to the Mutant Underground headquarters, he comes clean about being a double agent. Both the bartender and the family are horrified at his actions. He instead opts to run out of their van, allowing the bartender to use his invisibility powers to camouflage the van and escape. Agent Turner is not too happy about Reed’s change of heart and tells him that he’s now going down, something that Reed’s OK with. Caitlin and the kids realize that living on the lam is a lot harder than they thought. Unable to even get enough money for a cab, Andy proposes robbing a bank. This episode Andy shows his dark side. Instead of going through with robbing the bank, he uses his telekinetic powers to destroy ever meter machine on the street to get all the coins. Sure, it’s not robbing a bank, but it’s still breaking the law. After paying the cab driver in spare change, they head to Caitlin’s brother Danny’s house. While Danny is happy to see his sister, he doesn’t offer the help that she desperately needed. He has to look out for his own family, and abetting mutants could land him in jail as well. With the promise of one night’s rest and some money, that’s all he’s going to offer her. While playing video games, Andy and Lauren are hanging with their cousin in his room. Their cousin is just excited that his family are mutants and wants to see their powers in action, which they try to avoid. Only when Lauren checks social media and sees their fellow classmates posted a picture vandalizing their former house, Andy’s telekinetic powers kick in, destroying the cousin’s sports trophy. Because John’s extrasensory powers can track anything, he and Marcos head to Danny’s house the next day to try and get Caitlin and the kids out of there, knowing that they will get caught. Just as Danny is wondering who they are, there’s an anti-mutant posse made up of Danny’s neighbors. Turns out the cousin shared a photo of the smashed trophy with a friend and it went viral. The neighbors are armed to the teeth like minute-men demanding the mutants come out for “safety” reasons, they really wanted the $300,000 reward for their capture. After Danny goes outside to calm them down and gets attacked by his own neighbors, Andy’s dark side kicks in again as he uses his powers to blast open the front door warning them to leave him alone. It’s clear Danny has the makings of a magneto if he doesn’t ground himself real soon. Marcos uses his powers to blast one of the neighbor’s gun, and they escape. Now hot on the run (and with the neighbor’s chasing them), Marcos calls Dreamer to come up with a way to get them home safely, or they will have to use their powers against the posse. Desperate, Dreamer uses her powers to give Blink a happy memory. She gives Blink the memory of her and John kissing each other, she gave Blink one of her own memories with John (as they were former flames), which gives Blink a happy memory and motivation to save them all. She manages to successfully create a portal capable of hiding their getaway car. John confronts Dreamer afterward and is upset that she did this as now Blink will think that the two of them are a couple. Caitlin realizes the error of her ways and apologizes to Marcos. He understands as people do crazy things for their loved ones (like he will for and Lorna). Caitlin meets up with Danny, later on, to apologize for getting into trouble with his neighbors, but he tells her that they are family and that’s what they do. He reveals that he used his government connection to find out that Reed is going to be transferred to an even higher security prison and she needs to escape, knowing that she will never see her husband again. She and Marcos have other plans though, rescue! Next week, it’s a prison break!